Bodrum Airport Transfers to Turgutreis, Yalikavak, Gumbet, Ovacik. Do you have any plan to visit Turkey? If yes, then why don’t you set out for Bodrum? It is a must-explore spot for you. The city, also known as the Halicarnassus of Caria, houses the Mausoleum of Mausolus, which was considered one of seven wonders in ancient phase of history. 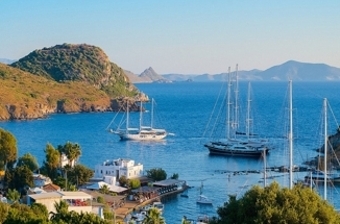 Bodrum is stepped in long and rich history spanning over thousand years. Artemisia as well as sister and wife of King Mausolos built it on his behalf. We make sure to earn you the best during your Bodrum trip. We abide by maximum baggage capacity regulations, allowing 2 persons with 2 pieces of baggage. All vehicles that we provide for airport transfer service are air-conditioned. Everything that can make your holiday more enjoyable is available in Bodrum and at an included price. Only thing remaining is to decide about how to reach your hotel from Bodrum airport. Public transport is not provided to reach commuters to hotels and moreover, taxi transfer is no best an option in Turkey. If you are visiting Bodrum for the first time, it is less likely for you to have any idea about if the taxi driver is driving along the shortest and best route to your destination. Fast, reliable and reasonably-priced Bodrun airport transfer is what you require. Go on “Book Now Online” and reserve your transfer in just 4 steps, you have the possibility to book extras too, like golf luggage, child seats or even a wheelchair or bicycle. After booking, you will receive your travel documents by e-mail within 30 minutes. You are expected directly at the terminal exit with a name board and driven to your hotel, otherwise there are no other guests. You can pay directly to the driver, you can also pay by Paypal if you wish.